Modulus of elasticity of concrete is the ratio of normal stress to the corresponding strain for tensile or compressive stresses below the proportional limit of concrete, ACI 318-14. The value of elastic modulus of concrete can be obtained using formulas provided by different codes, but the values may not be accurate. The accurate value of elastic modulus of concrete can be estimated using different tests. ASTM C469 (Standard Test Method for Static Modulus of Elasticity and Poisson’s Ratio of Concrete in Compression) can be employed to accurately determine the modulus of elasticity of concrete. 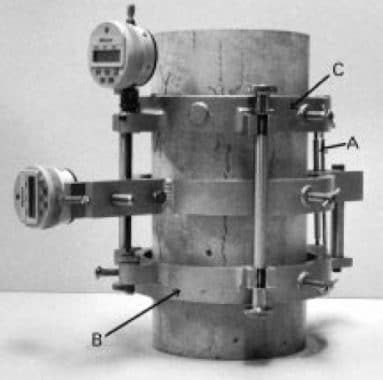 Moulded Cylindrical Specimen should be tested within an hour after its removal from curing or storage room. Modulus of elasticity can also be determined using a drilled core specimen. Requirements pertaining to storage and ambient conditions immediately prior to the test shall be the same as for moulded cylindrical specimens. Keep the ambient temperature as steady as possible throughout the test. 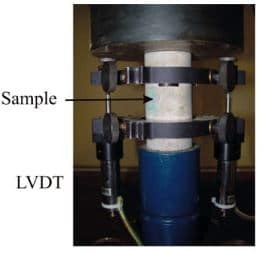 Use two specimens to specify the compressive strength prior to the modulus of elasticity test. Attach the strain-measuring equipment to the specimen. Place the specimen on the lower platen or bearing block of the testing machine. Align the axis of the specimen with the center of thrust of the spherically-seated upper bearing block. Load the specimen carefully to seat the gauge and observe its performance. Any abnormal response shall be corrected. After that, apply the load continuously; record the applied load and longitudinal strain when the longitudinal strain is 50 millionth, and the applied load is 40% of the ultimate load. S2: stress corresponding to 40% of ultimate load. e2: longitudinal strain produced by stress S2.